For as long as I have been a serious listener to New Music, I have appreciated the music of Morton Feldman. He is to me like listening to the ocean, only maybe better. Like the ocean surf, you expect within a certain set of guidelines the hissy, watery pulsations of foam and brine. So with Feldman the music is nearly always very quiet. Sometimes the music as Feldman himself remarked can unfold in endless patterns and variations like a Persian carpet. Other times he is less patterned and more atmospheric. Always he is mysteriously quiet. Long tone are the rule and happily so. 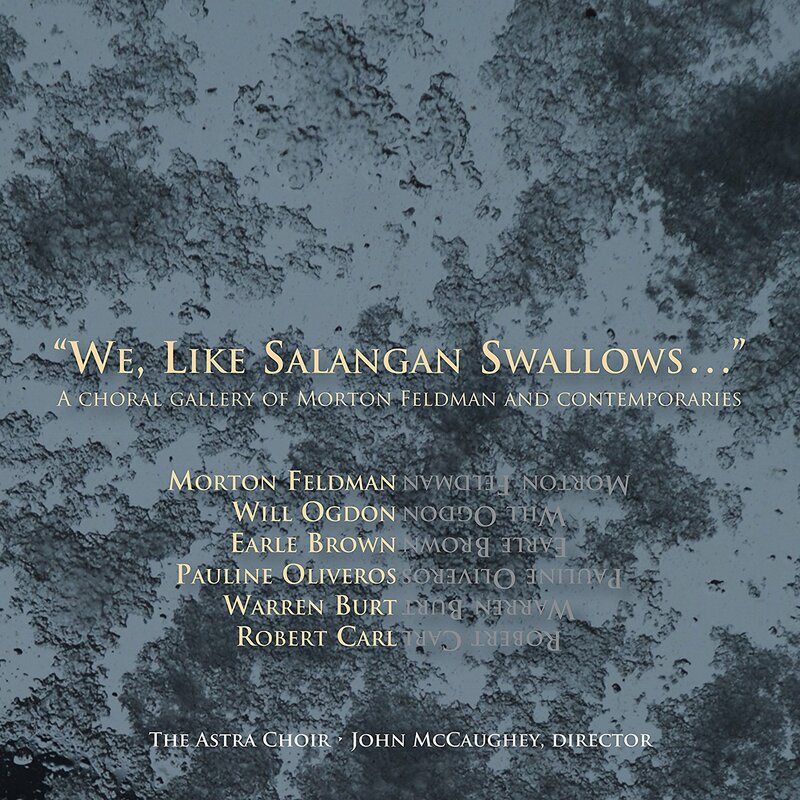 We get an opportunity to commune meaningfully through some more Feldman music right now with a new release entitled We, Like Salangan Swallows..." A Choral Gallery of Morton Feldman and Contemporaries (New World Records 80794). The Astra Choir under John McCaughey form the very solid and cultivated structural foundation for this program. Instruments are added as needed now and again. Essentially the album gives us thirteen worthy and spacey miniatures and/or mid-ly miniatures (say 15 minutes) for choral with or without chamber orchestral accompaniment. Choices of repertoire on his program are so interesting that you find yourself experiencing vibrant Feldman composing in varyingly subtle sub-styles (mid period and later) as compared with related contemporary composers and their ways. In the process of experiencing each well-performed work we get a sort of spectrum of New Music choral possibilities that are not entirely removed from Morton's own sensual treatment of the voice. So for example the Pauline Oliveros "Sound Patterns" (1961) gives us a lively change of pace with its playfully noisy vocalisms when contrasted with a Morton Feldman of "Chorus and Instruments" (1963), "Voices and Instruments" (1972), "Voices and Instruments 1" (1972), and "The Swallows of Salangan" (1960). There is an almost monk-like austerity yet a sensual beauty to Feldman's vocal works, a haunting wordless ghostly peace and wonder world. So we pit the Feldman works and the Oliveros with Feldman's colleague Early Brown and his "Small Pieces for Large Chorus" (1969). The connection is more plainly there than it perhaps it seemed to some listeners around 50 years ago. And then there is truly added value to experience some of the less familiar choral new music on the program, such as Will Ogdon's "Three Statements" (1956) Warren Burt's "Elegy" (2013), and Robert Carl's "The City" (circa 1983-93). I find choral Modernism a wonderful thing when it is done well. In this batch and its fine performances we feel that the voices are lovingly considered with every bar, that this is not music that an instrumental ensemble could perform with no noticeable drop off. No, rather we get music truly imagined with the dreamy possibilities of a gathering of fine vocalists sympathetic to the new. The close and edgy harmonies sound so human yet angelically etherial, the long sung lines seem heaven inspired, the sounds of the voices are utilized creatively to get textures no instruments or electronics could truly simulate. So we have New Music which by virtue of being primarily choral can be new upon new, so to speak. It is music with depth, music to drift into remote climes. All is well, all is very well performed, and I must not hesitate for a moment and instead urge you to go get it! You will be glad I think.